We love story time and we especially love having themed books to celebrate the holidays. Christmas is the most special of the holidays for us as we snuggle up by the light of the Christmas tree and read a Christmas themed story every night before bed. 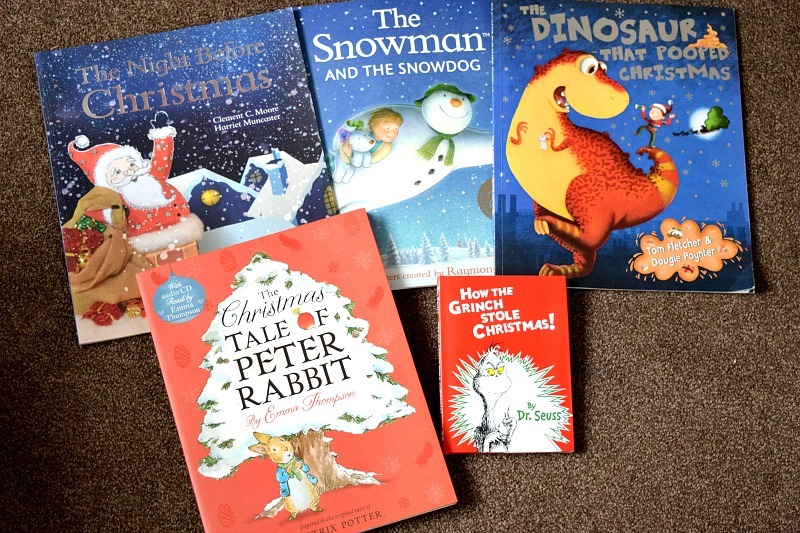 I have a huge pile of Christmas books that come out every December and here are five of the kids favourites! Our number 1 Christmas book ever! We have had this one a few years now and the kids have fallen in love with the whole series. Kid's love toilet humour and this is toilet humour at it's best. A greedy little boy called Danny wants EVERYTHING for Christmas. Until he receives a Dinosaur that eats the whole of Christmas. It is full of silly rhymes to make the children giggle as they follow the dinosaur eating everything including Danny's parents. Eventually the dino poops everything back out but it taught Danny a big lesson! Gracie is desperate to read Tom's new book The Christmasaurus which naughty Mummy hasn't bought yet. That might have to be an addition to our Christmas Eve box this year! We are huge Dr Seuss fans and Gracie owns his full collection of books. Of course it wouldn't be Christmas without The Grinch. The Grinch hatches a plan to steal Christmas from the citizens of who-ville, though. His evil plan backfires and he realises that presents are not the be all and end all of Christmas. The Grinch's too-small heart grows three sizes and he joins the citizens of who-ville for a Christmas feast! This is our annual Christmas Eve story. It is a lovely heart-warming rhyming story all about jolly old Saint Nicholas and his journey to deliver presents on Christmas Eve. We love to read this before bed when the kids are then ready to go to sleep, although slightly over-excited so that he can come and deliver their gifts. When Peter and his cousin Benjamin meet William the turkey, they realise that he is being fattened up for Mr and Mrs McGregor to eat for Christmas dinner. They come up with a plan to help William hide and escape. As a child I loved all of Beatrix Potter's stories and Peter Rabbit was a favourite. The kids love this story, especially when Mr & Mrs McGregor have to have just boiled potatoes and cabbage for Christmas dinner. It is so funny that they are like any farmers, yet when you see them from the animals perspective in the story you see them as the bad guys and route for Peter and his friends to win. In reality I would be devastated without a traditional Roast Turkey dinner at Christmas! When a young boy builds a snowman and snowdog in his garden he is amazed to find them come to life in the middle of the night. They take him on an adventure to the North Pole where they see snowmen from all over the world. After winning a race he is given a gift from Father Christmas. The gift is a dog collar. When he puts the collar on the snowdog, he turns into a real dog! The one thing the boy had put on his list to Father Christmas. The book is based on the animated television adaption which the kids also love! Do you have any favourites I haven't mentioned? I would love some suggestions!